Superiore Livello Roma 4-Bottle Rack will add an element of style to any room. Made using premium quality metal, varnished with a lustrous black finish, it is sure an artistic storage bottle holder addition to your classy kitchen! Now you have a secured storage for keeping up to 4 bottles of your favorite wine, champagne or any normal sized bottle of alcohol! Its perfect angle makes sure your wine is held firmly with sturdy support. So get your now and add a classic touch to your bar, kitchen or party! Enjoy your wine with friends, loved ones or even by yourself as you let our Superiore Livello Roma 4-Bottle Rack takes care of your wine and other liquor goods. BEST WINE HOLDER FOR ANY OCCASIONS.We know what you want for a wine rack: it should be beautiful and sturdy at the same time. So that is what we give you with our Superiore Livello Roma Wine Rack--a beautiful classy piece that you can give to your loved ones as a gift or an additional piece of art for your kitchen while serving you the purpose of holding your wine with a sturdy and firm support. STURDY AND FUNCTIONAL WINE BOTTLE RACK.Many wine holders do not serve you well--it is mostly wobbly and has the tendency to topple over. But we at Superiore Livello Roma Wine Rack made sure that our rack will hold your wine bottles, both open and unopened in a strong and sturdy support grip. It holds any normal sized wine or alcohol bottle up to 4 bottles. Making sure you enjoy your wine at home or at your party. EASY TO ASSEMBLE AND CLEAN.Sometimes you just want a nice and easy to assemble wine holder for a more enjoyable moment. You don't have to go through a lot of hassle figuring out which part goes where. This also makes it a lot easier to clean and maintain! So what more can you ask for? We give you a low-maintenance but high durability wine rack that can hold 4 bottles! RUST-FREE LUSTROUS BLACK FINISH.Looking for the perfect wine holder to match your place? Now you can! 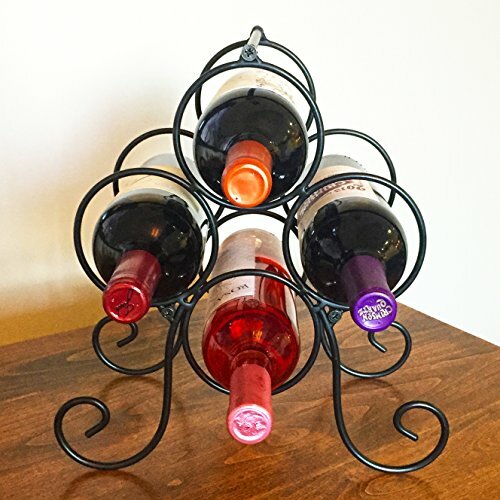 Our rust-free wine holder can be placed anywhere in your house or your office, even at a party! With its classy black finish, you're sure to never go wrong with whatever motif you are going for! 100% QUALITY AND SATISFACTION GUARANTEED!You will never go wrong with our Superiore Livello Roma Wine Rack. If you are not satisfied, you can return your product with no questions asked within 30-day of purchase! But we are sure that you won't because we guarantee you a 100% highest quality product made from top-grade materials to last you long! Durability at its finest. We also provide you a 2-YEAR WARRANTY. So hurry and get yours. If you have any questions about this product by Superiore Livello, contact us by completing and submitting the form below. If you are looking for a specif part number, please include it with your message.